Beef Shorthorns met an exceptional demand driven by the commercial sector in Stirling on Monday 21 October at the breed’s official autumn sale where bidding peaked at 12,000gns and records were smashed in the ‘new trading era’ with 16 bulls sold to average £4,305 and 90 females averaged £2,217. Sale leader at 12,000gns was the day’s champion, Alvie Elton TI +15, SRI +15, a roan two year old by the £5,000 Glenisla Zinzan and out of Millerston Irania Xanadu, the foundation cow in Catherine Williamson’s Kincraig, Inverness based herd which over the last eight years has grown to 20 breeding females. 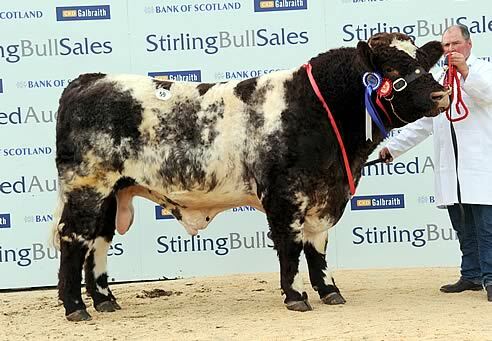 Earlier in the day, Elton was awarded the supreme male championship, a fitting reward after taking one of the two top titles this season at the Royal Highland, Perth, Grantown and Keith shows. “We’re absolutely thrilled for the herd to have achieved such success in a very short period of time,” said Mrs Williamson. Mr Altajir’s investment didn’t stop there. He went on to purchase a further 14 lots including the reserve female champion and leader at 5,800gns, Millerston Orania Fizz TI +12, SRI +10. 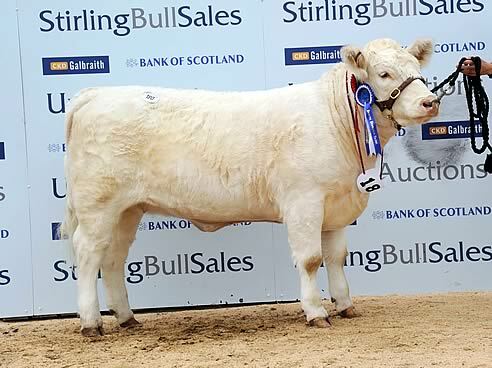 A 19 month old white heifer, she was among the first progeny to be sold by the 14,000gns Stirling junior champion, Podehole Beefeater and out of a homebred dam from Jack Ramsay’s Mauchline based 25 cow herd. The day’s second top call at 9,000gns was made by J Wink and Sons, Huntly for the reserve male champion, Langalbuinoch Fantastic TI +13, SRI +11, a 19 month old red and white bull from R and P McAlister, Kingarth, Isle of Bute. A Newfield Tarquin son, he was out of a homebred dam going back to Loch Awe lines. Two bulls commanded a 5,000gns bid and both from Orkney buyers. First to go was Gregors Fernando TI +20, SRI +20, a 20 month old roan bull from Chesterhall Parks Farm, Wiston, Biggar. Sired by the Barnaigh Loch Awe and out of a homebred dam going back to Uppermill lines, he sold to EM Flett, Holm. 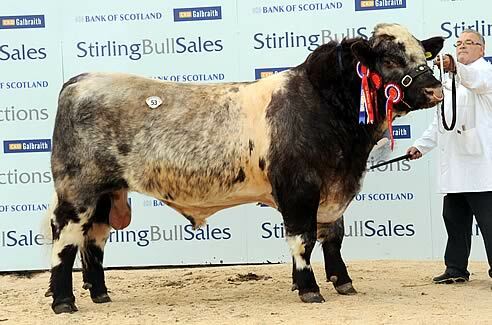 The second 5,000gns entry was the 19 month old Knockenjig Fearless TI +32, SRI +25, a roan Meonhill Charlie Chaplin son and out of a Gregors bred dam from David and Rosemary Dickie, Sanquhar, Dumfries. The buyer was RFJ Seatter, Sanday. The Dickies also secured a bid of 4,000gns from F Baird, Tetbury for their same way bred 19 month old red heifer, Knockenjig Rosie Duchess TI +23, SRI +23, sold in calf to Tofts Whiskey. Castlemount Frankie TI +12, SRI +14, a two year old roan bull from D McDowell and SJ Martin, Newtownards, County Down returned over the water with N Gibson, Belfast for 4,000gns. A Chapelton Neptune son, he was out of a Glenbrae bred dam. A second 4,000gns bid was made, this time by Tullochgorum Farm, Boat of Garten, Inverness for Alvie Emblem TI +18, SRI 18, a two year old roan bull by Glenisla Zinzan from Catherine Williamson. Two more entries were in the money for Mrs Williamson. At 3,200gns she sold to K and B Brown, Milnathort, the red and white maiden heifer Alvie Fern Broadhooks TI +17, SRI +14, an Alvie Diamond daughter and out of a Glenisla bred dam. Alvie Lovely Friday TI +23, SRI +20, a 17 month old red and white maiden by Zinzan and out of a Croxtonpark bred dam made 3,000gns to A Park, Charlton, Malmesbury. The day’s second highest female call at 5,400gns went to the female champion, Galla Floss Zeta TI +18, SRI +15, an 18 month old roan Kidston Rambo daughter and out of a Winningbank bred dam. 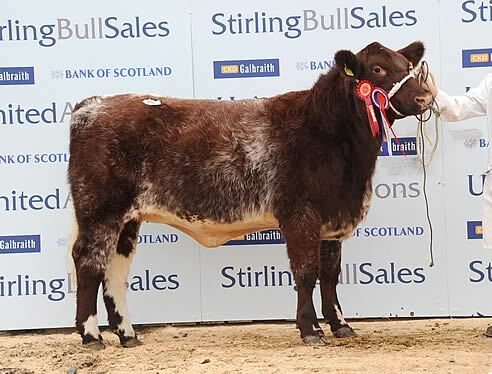 Bred and exhibited by JW Frame, Wiston, Biggar, she was knocked down sold to M Haigh, Glenluce, Stranraer. Heading a draft from Carey Coombs, Carnwath at 4,500gns was Dunsyre Honeysuckle Opal 6 TI +17, SRI +15, a six year old light roan cow by Dunsyre Yorkie and sold with her five week old heifer calf, Dunsyre Honeysuckle Opal 19 by Langalbuinoch Barney. The pair went to HD Bailie, Dromara. Shawhill Dewdrop Fairlady TI +12, SRI +8, a red 20 month old maiden all-Canadian ET heifer by K-Kim Freedom and out of a Braebank dam from Shawhill Shorthorns, Eaglesfield, Lockerbie sold for 3,800gns to S and C Currie, Rathmell, Settle. Minutes earlier, Shawhill Fancy TI +20, SRI +14, an 18 month old maiden by Alvie Blue Eyedboy from the same breeders made 3,000gns to Smallburn Farms, Elgin. A draft from Major John Gibb and his daughter Catriona, Blairgowrie, Perth, was led at 3,500gns by Glenisla Foxglove Flake TI +24, SRI +21, a 19 month old roan heifer by Dunsyre Cavalier and out of a homebred dam by Broughton Park Thunder. The buyers were H and M Sloan, Oxton, Lauder. Their next entry at 3,000gns to Messrs Macdowell was Glenisla Margo TI +15, SRI +13, a roan maiden by Glenisla Artic Storm. Top lot from Cupar based W and J McGowan and Son’s draft at 3,000gns was Fingask Rosette Elga TI +18, SRI +15, a Bon-Accord Angus sired two year old heifer. The buyer was W Denham, Langleydale, Barnard Castle. Averages: 16 bulls £4,305; 90 females £2,217.